In May 1915 the Kingdom of Italy entered the Great War as one of the Entente nations. 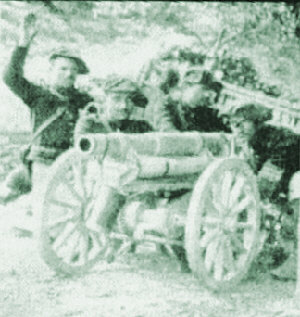 A few weeks later the Italian Army attacked the Austrian frontier defences and achieved some success, mainly in the mountains north of Trieste. Here the Commando Supremo, General Luigi Cadorna, orchestrated a series of desperate assaults known as the Battles of the Isonzo. In August 1917 the eleventh of these violent clashes left the Austrians in dire straits. The k.u.k. was generally in a bad way after three years of heavy losses in Russia, Serbia and Italy, and desperate for relief The AOK turned to their German allies who came up with a plan for a short offensive to push the Italians out of the mountains. In late October 1917 the Battle of Caporetto not only pushed the Italians onto the plains but forced them back to the river Piave, where the CS managed to organise and establish a new front line. The despised Austro-Hungarians were back in the Veneto, this time accompanied by fit, battle-hardy and disciplined German divisions, and it was the turn of the Italians to seek help. Early in the battle General Cadorna appealed to the French and British for assistance, on the basis of an inter-Allied agreement made in December 1915 during a conference at Chantilly, near Paris. Britain, France, Italy, Russia and Serbia had each undertaken to hold itself in readiness to stop any enemy offensive on its own front with its own resources, and to assist, to the fullest possible extent, an ally faced with a similar situation. A year later, at another conference, mutual support was again discussed, and talk changed to planning. The British and French each envisaged sending an expeditionary force of two Army corps; about 120,000 men and 26,000 horses, to Italy. The British plans were prepared under the direction of Brigadier General JHV Crowe, assisted in Italy by the British Military Mission, Italian staff officers and representatives of the British and Italian Foreign Offices. The Official History contains a good description of the plans and the associated administrative procedures. 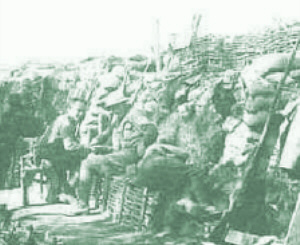 French staff officers in the Theatres d'Opérations Extérieures (TOE) section of the GQG and Italian officers in the CS made similar arrangements. Thanks to the hard work of these officers, after Cadorna's appeal French and British troops were quickly sent to Italy. By 27 October French advance parties were in Italy and British teams followed a few days later. Most military trains in France and Flanders were generally of a standard 'consist': engine, two coaches, thirty of the dreaded Chevaux 8 Hommes 40 vans, seventeen flat cars for vehicles and stores, and two brake vans. One train could carry any unit or sub-unit where the permutation of men and animals did not exceed the capacity of the box-vans; e.g. half an infantry battalion, or half an RFC squadron. As the journey to Italy would take at least five days, space had to be found for rations and forage. As it was thought the troops might go straight into action so pick-axes, spades and sandbags also had to be crammed into the vans. Most accounts of Great War journeys bemoan the slow speed of the trains. Throughout France, Flanders and Italy, military trains were scheduled to travel through each section of a route at a specific speed, which averaged 30 kph / 171/2 mph for every journey. This unhurried progress may have exasperated the troops, but it helped the railway authorities control, as much as war conditions allowed, complex traffic movements. Dawn found us at Longueval, not far from Paris; next dawn we were beside the great Sâone in Beaujolais. The men were enraptured by the scenery. So down the long, lovely valley beneath the Cèvennes, and over the Isêre, till at evening time we saw the high snows of the Dauphiny [sic]... we seemed to be in a new continent - houses of a new type, olive and orange trees, cypresses and aloes, a bright sun, a buoyant sparkling air, white hard roads, (fancy, a dry road, Alf), and now those lovely bays. 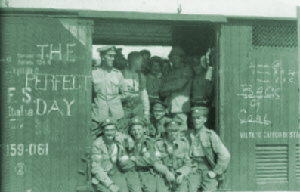 The British Expeditionary Force (Italy) detrained around Mantua, south of Verona, and were briefly held in that area as a backstop in case the enemy onslaught crossed the Piave. The GOC was General Sir Henry Plumer, at that time commanding Second Army in France, and one of the best British commanders of the Great War. The fact that Field Marshal Sir Douglas Haig selected him to command the expeditionary force indicated the seriousness with which the British authorities viewed the threat to the Italian nation, the Otranto Barrage and the Mediterranean seaborne lines of communication. Through a little town (Albaredo) we marched to a hamlet here Major Bate achieved a feat which added indescribably to our comfort and well-being all the time we were in Italy. he stole an interpreter, an Italian soldier from London, Luigi Ciapancelli by name, Lulu to our tongues and in our hearts, the best little man that ever made macaroni scarce. Fortunately many of the Carabinieri, who in Italy carried out many of the functions of military police, spoke some English. All were intelligent and energetic; having by force of circumstances to work closely with British MPs they soon became fluent, as did many of their English colleagues in Italian, to the surprise of their officers and countrymen. On our arrival in Italy we had been admonished to keep smart and emulate the Guards. During the preceding days much spit and polish had been expended. We were now expected to create an impression, to inspire confidence in the people, who were to see and hear about the Allied contingents marching with drums beating and fifes playing in smartly-uniformed and well-aligned columns of four, towards the field of battle. The local population, and newspaper reporters from across Italy, were suitably impressed by the long columns of Allied soldiers; smart, disciplined, healthy, cheerful and vigorous. They were in sharp contrast to stragglers from Caporetto slowly making their way westwards. These Sbanditi were shepherded into assembly areas well away from the operational zone; quiet places where shattered units could rally, and exhausted and demoralised men recover in body and soul. But the Italian nation rallied after the disaster at Caporetto; and propaganda posters appeared everywhere, exhorting everyone to fight and support the nation in its time of danger. The French expeditionary force, the Tenth Army (GQC General Duchêne), were concentrated west of Verona, around the southern shores of Lake Garda, partly to counter a rumoured Austro-German offensive down the valley of the river Adige from the Tyrol. Some of the French troops knew they were marching in their forefathers' footsteps. The Tenth Army passed the battleground of Solferino where, in August 1859, a French army fought an Austrian one; both claimed a victory. The resulting carnage, or rather the sufferings of the wounded left where they fell in the full heat of summer, eventually led to the formation of the International Red Cross. Some French officers knew about the Battle of the Piava (correct spelling at that time, May 1809), when a Napoleonic FrancoItalian Army waded the river near Nervesa and defeated an Austrian army retreating from the Veneto; in 1917 the tale was recounted in cafés and considered to be a good omen. On 6 April 1917 the United States of America entered the war as an ‘Associated Nation’ of the Allies. One infantry regiment, the 332nd, served in Italy, along with several supply and medical units. In addition, a number of American Red Cross (ARC) and YMCA personnel provided care and comforts to the Italian Army, and later to the 332nd Infantry, its support units and the US Military Mission. A very small number of American doctors served in Italy in the ranks of the British Army as unit (infantry battalion, artillery regiment) Medical Officers, but by late November 1917 most had been returned to France to join the American Expeditionary Force. At that time the USA was still not at war with Austria; that occurred in 7 December 1917. 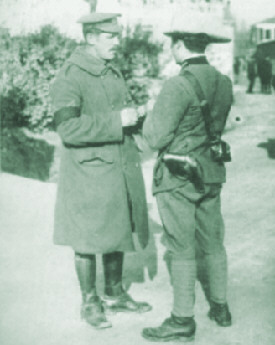 There were exceptions, for example Captain S Bayne-Jones US Army Medical Corps served with 11/Sherwood Foresters in France and Italy and was with the unit on the Montello and (briefly) the Asiago Plateau. In addition to the 332nd and the ARC men (and women), a number of US trainee pilots were sent to Italy under the inspiring leadership of Fiorello La Guardia, at that time a lawyer and recently-elected Congressman for the 14th District of New York, who had learned to fly in 1915 and managed to go solo. In addition, significant numbers of immigrants returned to Italy as recalled reservists or volunteers for the Italian Army. Apart from those killed in fighting along the Austrian frontier and in accidents, some were killed at sea. In January 1916 an Italian merchant ship, the Brindisi, was crossing the Adriatic with war materials and food for Italian and Serbian forces in Albania. She was also carrying several hundred Italian-American volunteers for service with the Italian Expeditionary Force in that country. The Brindisi hit a mine and sank with the loss of over two hundred lives, many of them the luckless volunteers. The mine had been laid by the German UC 14 which was operating against Allied shipping in the Adriatic despite there being no state of war between Italy and Germany until August 1916. 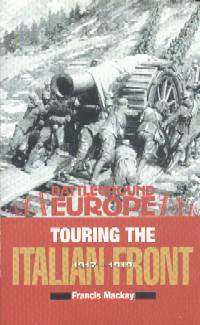 TOURING THE ITALIAN FRONT, 1917-1919 can be ordered at the Pen & Sword, Ltd. Website as can the other selections in the publisher's Battleground Europe series.